Blog DIY - How to Build a Mini Sound Booth for Voice Over Recordings Under $20! 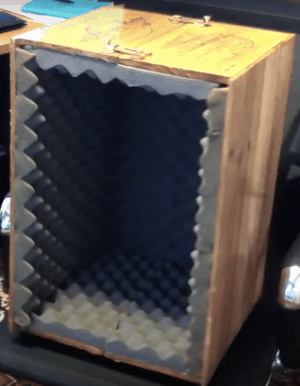 DIY – How to Build a Mini Sound Booth for Voice Over Recordings Under $20! 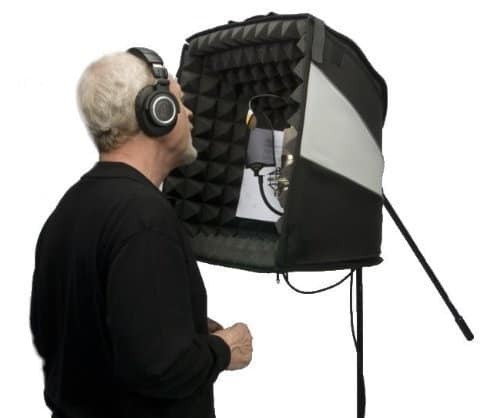 Have you ever wanted to buy a mini Sound Recording Booth for your voice over recordings; but didn’t want to spend too much money? In this articles, I will show how you can make a mini sound recording booth for under $20 that will work just as good as the real deal! Some also call this a microphone isolation box, in case you’re wondering. The first item you will need for this project is a box. It doesn’t matter what kind of box you use. I would recommend something sturdy and large enough to accommodate the interior insulation. The one I would choose is are the large Rubber or plastic tub/tote. You can buy those at your local Walmart for around five dollars. To my surprise, I could not find an inexpensive rubber or plastic tote on Amazon. I saw a bunch of them at my local Walmart for around five dollars so I would suggest you look there for the best deal. All the ones I saw on Amazon were about fifteen dollars and up. And it defeats the purpose of building an isolation box if you’re going to spend more money building versus buying a professionally made box. Secondly, you will need some adhesive spray. I recommend Loctite multi-purpose spray adhesive from Amazon. The reason why I chose this particular adhesive is its easy application and the affordable price of approximately five dollars. You do not need any special acoustical glue for this project because you’re not “soundproofing”, you’re merely reducing the echo. Acoustic Foam to place inside a DIY Mini Microphone Sound Booth. And finally, you will need some acoustic foam. I saw some people recommending a foam mattress pad. But I could not find one that was cheap enough to make it worth wild. You might have an old foam mattress pad you could use or find one at your local Walmart for a decent price. Acoustic foam works excellent and is now relatively inexpensive, especially for the amount you will need for this mini sound booth. 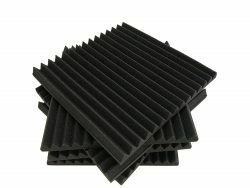 The acoustic studio foam I recommend is Beefoam 6 Pack 12″ X 12″ X 1″ acoustic studio foam panels (Amazon Link) for around ten dollars. Microphone Sound Isolation Booth made from Acoustic foam and wood box. Building the mini sound booth for your voice over recordings is the easy part; now that you found all your materials. First, make sure the box you’re using is clean by thorally washing and drying it making sure the adhesive will stick. It’s now time to take the six-pack of acoustic foam and place it inside the box. Make sure to cover all surface areas. Your mini sound booth might not work well if there is even a crack in the box that shows between the acoustic foam pads. Now that you know the exact size of acoustic foam you need, grab some scissors and cut it up to make it tightly fit inside the box. Spray some Loctite adhesive inside the box making sure you cover all areas to make sure the foam properly sticks. Cut thin layers of acoustic foam to slide inside any cracks you find to make sure you can’t see the box between the foam pads. That’s is, the process is done! It’s not a complicated project, but it is a project that I never thought of until I received a question from a friend, he wanted to know if I knew anyone that had ever built one of these sound booths in this small size. Blue Snowball Microphone is Perfect for a homemade Sound Isolation Booth. The Sound Isolation box is now complete, and now you need to set up your microphone. 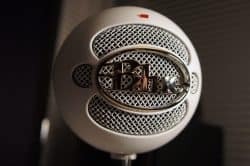 I use the blue snowball microphone because the price could not be beaten with the type of quality. I had read many reviews, and I honestly did not want to pay a fortune for a microphone since I only use it for skype conference calls with clients, and I also make the occasional YouTube video when I have the ambition to do so. Click here to check out the blue Snowball Microphone on Amazon. This microphone comes with a sturdy mini tripod that would have no problem standing upright in a mini Soundbooth. Maybe after you ran all the numbers, you found it easier to buy an already made professional microphone isolation box. I did some research and read a bunch of reviews, and the one I saw that would be perfect for someone on a budget is “Portable Microphone Studio Voice Booth Isolation Box” from Amazon. Click here for current pricing. You can typically buy one of these mini microphone sound booths for around fifty dollars. These types of boxes are perfect for Podcasting and Youtube voice over recordings. Please let me know if you successfully built one of these microphone isolation box. Tell us if you did anything different or if you found better deals on the materials. 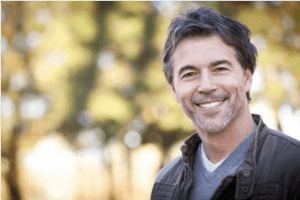 If you did find better deals then I would be happy to look into it; and make the proper updates to this article, so everyone reading can benefit with the best value for your money!